Leverage your guest WiFi with the Bloom Intelligence WiFi marketing platform growth tools. 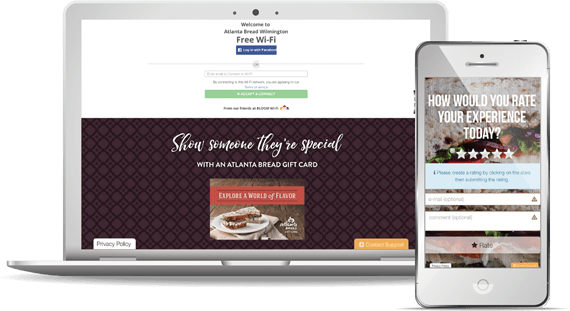 You can build customer profiles, onboard customer data onto third party applications, and automate marketing before they gain full access to the internet from your WiFi captive portal. Bloom allows you to choose from a list of powerful functions to include on your WiFi landing page. They include ratings, social media integrations, mobile app downloads, guest registration options, banners, and much more. You communicate design preferences and provide creative collateral. Then our professional designers create your new dynamic smart WiFi landing page. Once you capture your customers’ profiles you can automate marketing to your guests. You can send offers, messages, and surveys based upon their behavior whether they log into your guest WiFi or not. 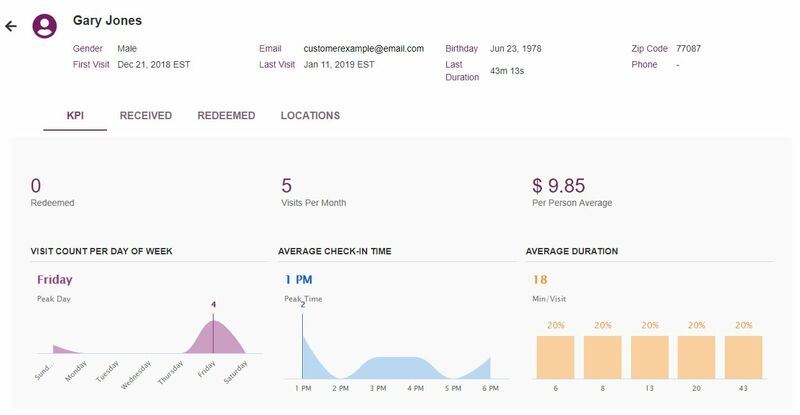 Profiles include verified emails, names, phone numbers, zip codes, birthdays and your customers’ behavior at your locations. When a customer has a WiFi-enabled device, such as a smartphone, tablet or laptop, it is continuously sending out a broadcast signal searching for the nearest and strongest WiFi networks. At the same time, the WiFi network access points are continuously “listening” for those signals. Consequently, when the signals see each other, a wireless connection can be made. Every mobile device has a unique identifying code. The WiFi signal it broadcasts contains this code, which is how Bloom will identify individual customers. The unique code is captured and logged into the database. After that, the physical activity of that device is recorded, even if they don’t log into the WiFi network. Users can filter the data for any date range. Likewise, multi-unit chains can make comparisons between locations or groups of locations. This data can be invaluable in creating and measuring marketing campaigns. When a customer attempts to access the internet on your WiFi access point, they will be sent to your captive portal. A captive portal is a web page that users are required to see and interact with prior to being given access to a network or the internet. You choose which functionality you’d like on your captive portal page, and we professionally design it. Of course, the most important benefit of the captive portal is the customer information that can be collected, resulting in a detailed customer profile. Learn more about Bloom’s social wifi solution. The data discussed above is powerful for improving your business. However, when customers log into your WiFi a significant portion of the value of Bloom’s WiFi analytics and marketing platform is realized. A customer profile is created in real-time when the customer logs in using their email address or Facebook account. Additionally, using progressive profiling, every time a customer logs into your WiFi, Bloom will require any missing piece of their customer profile, such as name, zip code, birthday or gender. This will build a comprehensive, useful profile. Then you can create targeted marketing campaigns based on demographic data as well. Keep in mind, unlike other companies, that a customer only has to log in once into Bloom’s social Wifi portal, and we can then trigger restaurant marketing campaigns based upon behavior on or off location. By targeting specific customer segments, you will improve your marketing results, customer engagement, and loyalty. You choose which elements you’d like to include on your captive portal page. You can brand the page with your company logo, images and colors. Brand consistency is important in today’s competitive marketplace. Having a consistent brand image, voice and tone will help solidify trust and engagement with your customers. Well-executed branding can create a strong and lasting impression. Whatever your branding consists of, you need to make it consistent across all marketing and advertising channels, including your guest WiFi user experience. Additionally, you can throttle the bandwidth of your guest WiFi to each user. This will ensure the performance will remain excellent even during peak traffic time. It’s time to start leveraging your guest WiFi to gain a competitive edge. Then watch your profits grow. If you’re ready to see how to leverage your guest WiFi with Bloom Intelligence, call us today at 727-877-8181. We’ll set up a free demonstration for you and your team. Collect customer contact profiles 7X faster. Ask users to register for your loyalty program or download your app before getting online. Encourage customers to leave their positive reviews on TripAdvisor, Google +, or Zomato. Offer a featured deal in exchange for likes, shares, follows, etc. Increase sales revenue by promoting your gift card program. Promote your specific items digitally on your landing page. Promote upcoming events on your landing page. Bloom automatically verifies your customer’s email when they log into the WiFi. Therefore, if a customer gives a fake email we ask them for a real one before they can log into your guest WiFi.